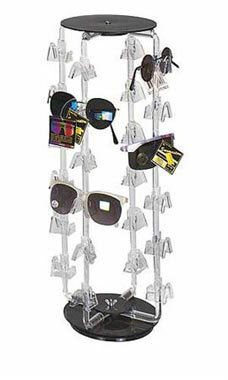 Organize your eyewear merchandise with our stylish and affordable Rotating Eyewear Displayer. The unit is perfect for displaying all types eyeglasses and sunglasses. The jewelry displayer is made from durable acrylic that allows the merchandise to be seen from all angles. Each unit includes 6 tiers on each of its' 4 sides. The top and bottom of the unit are black plastic.